NASA Space Place – What Is The Asteroid Belt? Poster’s Note: One of the many under-appreciated aspects of NASA is the extent to which it publishes quality science content for children and Ph.D.’s alike. NASA Space Place has been providing general audience articles for quite some time that are freely available for download and republishing. Your tax dollars help promote science! The following article was provided for reprinting in May, 2018. There are millions of pieces of rocky material left over from the formation of our solar system. These rocky chunks are called asteroids, and they can be found orbiting our Sun. Most asteroids are found between the orbits of Mars and Jupiter. They orbit the Sun in a doughnut-shaped region of space called the asteroid belt. Asteroids come in many different sizes—from tiny rocks to giant boulders. Some can even be hundreds of miles across! 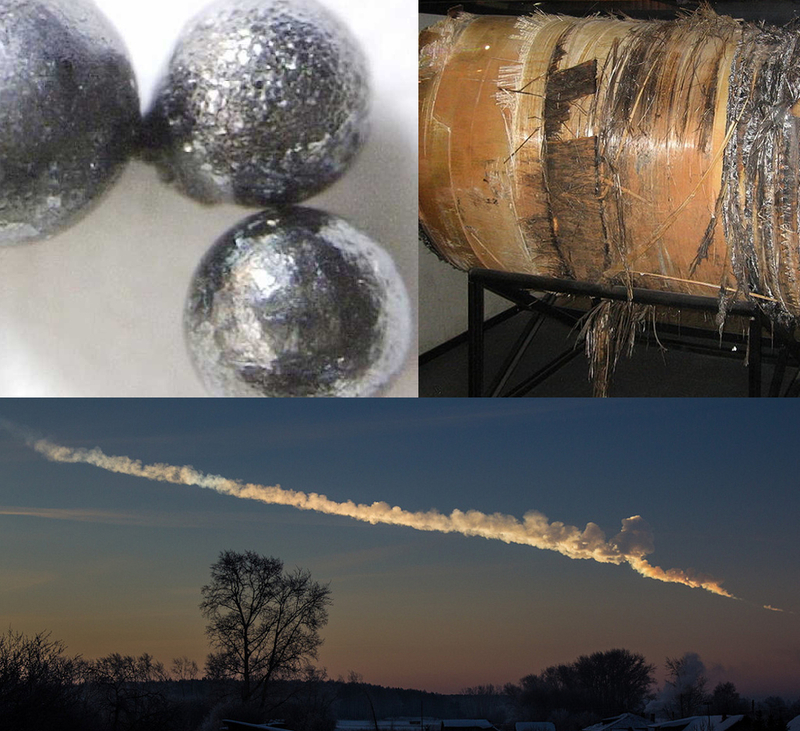 Asteroids are mostly rocky, but some also have metals inside, such as iron and nickel. Almost all asteroids have irregular shapes. However, very large asteroids can have a rounder shape. The asteroid belt is about as wide as the distance between Earth and the Sun. It’s a big space, so the objects in the asteroid belt aren’t very close together. That means there is plenty of room for spacecraft to safely pass through the belt. In fact, NASA has already sent several spacecraft through the asteroid belt! The total mass of objects in the asteroid belt is only about 4 percent the mass of our Moon. Half of this mass is from the four largest objects in the belt. These objects are named Ceres, Vesta, Pallas and Hygiea. The dwarf planet Ceres is the largest object in the asteroid belt. However, Ceres is still pretty small. It is only about 587 miles across—only a quarter the diameter of Earth’s moon. In 2015, NASA’s Dawn mission mapped the surface of Ceres. 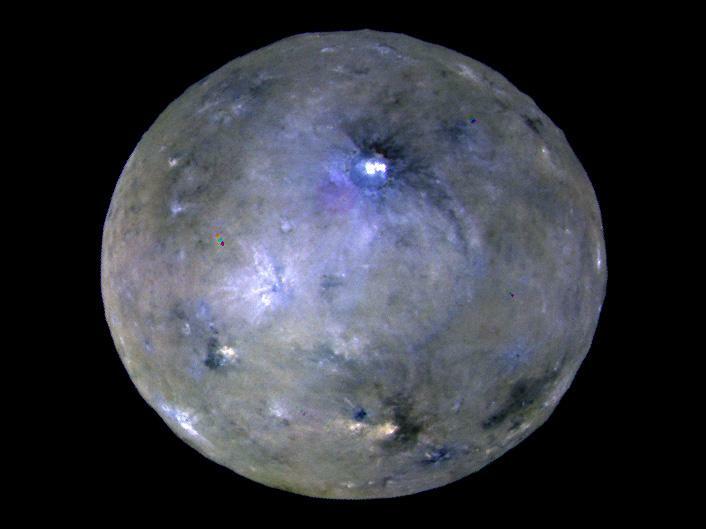 From Dawn, we learned that the outermost layer of Ceres—called the crust—is made up of a mixture of rock and ice. The Dawn spacecraft also visited the asteroid Vesta. Vesta is the second largest object in the asteroid belt. It is 329 miles across, and it is the brightest asteroid in the sky. Vesta is covered with light and dark patches, and lava once flowed on its surface. The asteroid belt is filled with objects from the dawn of our solar system. Asteroids represent the building blocks of planets and moons, and studying them helps us learn about the early solar system. With articles, activities, crafts, games, and lesson plans, NASA Space Place encourages everyone to get excited about science and technology. 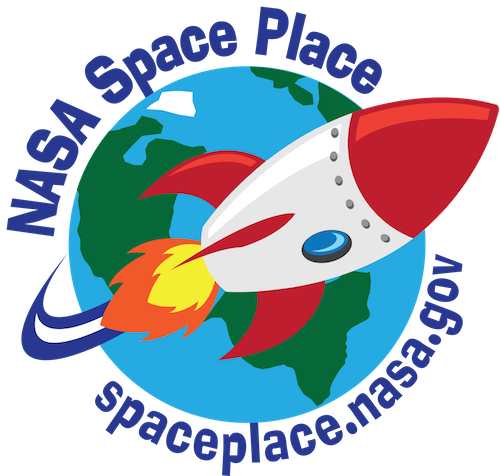 Visit spaceplace.nasa.gov (facebook|twitter) to explore space and Earth science! 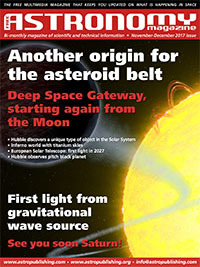 The most recent issue of Free Astronomy Magazine (November-December, 2017) is available for your reading and downloading pleasure at www.astropublishing.com (click the link to go directly to the issue). Free Astronomy Magazine was featured as the first of a series of articles on great free online content for amateur astronomers (see A Universe Of Free Resources Part 1) and we’ll be keeping track of future publications under the Online Resources category on the CNYO website. 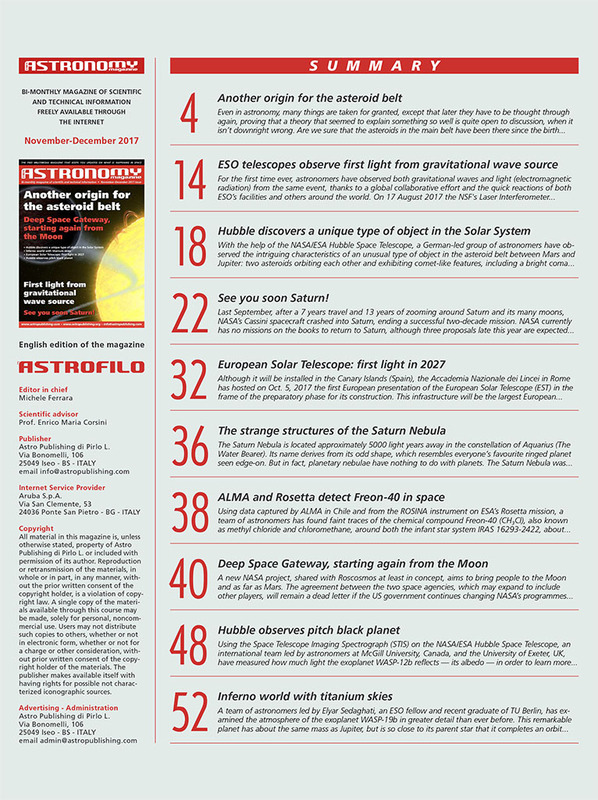 You can find previous Free Astronomy Magazine issues by checking out our Free Astronomy Magazine Category (or look under the Education link in our menu). For those wanting a quick look at what the issue has to offer, the Table of Contents is reproduced below.